Renal cell carcinoma (RCC), which accounts for 2% to 3% of all adult malignant neoplasms, is the most lethal of the urologic cancers. The mortality rate of RCC is as much as twice that of bladder cancer1,2. There is no epidemiological data available from Indian subcontinent. However, the disease is fairly prevalent in our country. In 2010, an estimated 58,240 Americans were diagnosed with renal malignancies and 13,040 deaths were estimated3 . In 2008, there were an estimated 88,400 new cases and 39,300 kidney cancer–related deaths from RCC in Europe4. Surgical excision remains the only curative treatment as this tumor is remarkably resistant to radiotherapy and chemotherapy. 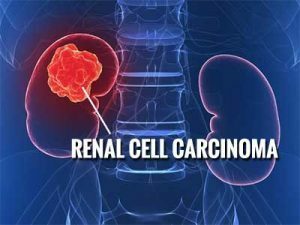 Ministry of Health and Family Welfare, Government of India has issued the Standard Treatment Guidelines forRenal Cell Carcinoma. Incidental: detected on imaging (CT / ultrasound) performed for other indication. Symptomatic: local / metastatic / paraneoplastic. Weight loss, fever, night sweats, recent onset hypertension, anemia / polycythemia. Cervical lymphadenopathy / non-reducing varicocoele / pathological fracture. Any mass lesion detected on ultrasound needs further imaging. CT / MRI abdomen & pelvis/ MR Urography – both without and with contrast (if renal functions permissible). MRI specifically indicated if disease is infiltrating adjacent organs or IVC thrombus (triphasic multiplanar CT or high resolution color Doppler ultrasound optional for the latter). Blood investigations-Hemogram, kidney functions, alkaline phosphatase (ALP), calcium, albumin, lactate dehydrogenase (LDH). Chest X-ray-in all cases. Further imaging (CT scan) required only if clinically indicated or primary tumor locally advanced or lymph-nodes enlarged. Bone scan-only if clinically indicated (bone pain, raised ALP) or primary tumor locally advanced or lymph-nodes enlarged. PET CT-not routinely recommended in the workup for RCC. Has good specificity but low sensitivity in the evaluation of metastatic disease. Currently, it may be considered in case of equivocal findings on conventional imaging, where detection of metastatic disease will influence management decision. Considering inflammatory mass / lymphoma / metastasis, vague Radiology, multiple masses, associated significant lymphadenopathy. Considering non-surgical therapy (e.g. cryotherapy, systemic therapy in case of metastatic disease) / active surveillance (small renal masses) / watchful waiting. invading perirenal or sinus fat. In addition to clinical stage, patient’s performance status (ECOG5) should be taken into consideration before deciding the treatment options. In patients with early stage RCC radical nephrectomy is justified when NSS is technically not feasible / the patient understands the other option (NSS) and opts for RN. Imperative indications of NSS: solitary kidney, compromised function or reserve of contralateral kidney (chronic renal insufficiency, severe diabetes mellitus, severe hypertension), bilateral synchronous tumors, familial RCC. Lymphadenectomy – may be performed for better staging. LND in patients with high-risk disease improves stage assessment and may prolong survival6,7. A mere sampling of the renal hilar lymph nodes is insufficient for pathologic staging. For right sided tumor, paracaval and interaortocaval lymph nodes and for left sided tumor para-aortic and interaortocaval lymph nodes should be removed from the crus of the diaphragm to the common iliac artery. If disease is confirmed within the interaortocaval nodes, a complete retroperitoneal LND is recommended to define the full extent of metastatic lymph node involvement. Adrenalectomy: not required unless direct invasion or tumor nodule (stage changed). Patients of stage IV disease are candidates for adjuvant systemic therapy (vide infra). may not be available everywhere. Centers which intend to treat RCC must be equipped with facility for histopathology / CECT / Blood transfusion. If above facilities not available / locally advanced disease / patient wants NSS → ref. to higher center. * CT chest can be replaced with CxR after initial 3 years. Metastatic RCC with resectable disease (cytoreductive nephrectomy and metastatectomy should be done whenever feasible). Targeted therapy in the form of tyrosine kinase inhibitors (1-4) and m-TOR inhibitors (5-6) have become first line systemic treatment for management of metastatic RCC. A substantial improvement in progression-free survival and overall survival has been achieved in large randomized controlled trials, when compared to Interferon-α. These agents have also been found to be effective in non-clear cell RCC, which are typically resistant to cytokines and interferons. Sarcomatoid variant is associated with poor prognosis, and a modest response with doxorubicin & gemcitabine is observed. Note : Targetted therapy for metastatic RCC/ locally advanced RCC should be decided by Urologist and given in supervision of a Urologist.